"Darr, are you pondering what I'm pondering?" "I think so, Darr, but what if the chicken won't wear the nylons?" If Darren hadn't said it recently in one of those throw away remarks that he does that set my brain alight (as it does) I'd never have copped it. The similarities are extensive. One Darr's the happy go lucky one where as the other is the intense, thinking one. 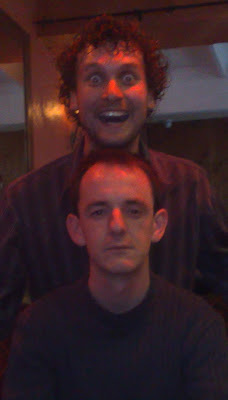 One Darr is the funny one, the other is the funny looking one. One Darr can brighten any room by entering, the other does the same by leaving. Darr's always pondering and Darr is never pondering what Darr's pondering. Well, hardly ever. If you need any more proof, just look at the ears... At least his are hidden by the hair! 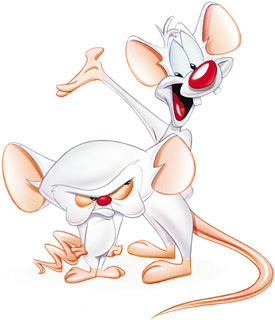 For those of you who aren't familiar, Pinky and the Brain are characters from a 90s TV cartoon called Animaniacs. Both lab mice, Brain plots to take over the world while Pinky aids him in plans that never quite work out. They have a complex relationship that on the surface shouldn't work out and yet does, providing surprise and amusement for all those who come in contact with it. Sound familiar, anyone? Brain's head is large and wide, supposedly housing his abnormally large brain. He appears to be coldly unemotional and speaks in a deadpan manner. Pinky is more open-minded than the Brain and much more up-beat. He doesn't let troubles ruin his day. He is also more attuned to the world at large, due to a large amount of time watching television or following other popular culture fads; as such, he tends to think in less rigorous patterns than the Brain, and has offered solutions that Brain would have not come up with. I think so, Darr, but what if the hippopotamus won't wear the beach thong? Darren and I struck up an unlikely friendship online just over 18 months ago, and have known each other in "real life" almost as long. (Yes Darr, it does feel like longer!) At the time I had moved to Dublin city centre from London, via a few months in Barretstown so most of the people I had known before London had either moved away or we'd lost touch. I was looking for someone to take over the world with people to become friends with and through a random combination of liking the interaction we had on the forums - he's always been a clever, insightful writer - and Darren and Lottie being open to meeting, that's how it began. Our personal interaction is amusing in many ways. Although both Leos (our birthdays separated by a week (and three years)) and therefore apparently destined to dominate for top lion, our personalities instead serve to complement our often manic natures. In crowds we both revel in the spotlight, one being the personality and the other the inventive one with the roles interchanging often. Our styles of communication may differ but we share the same (often very strange) sense of humour where it often doesn't take that much to set us both off. 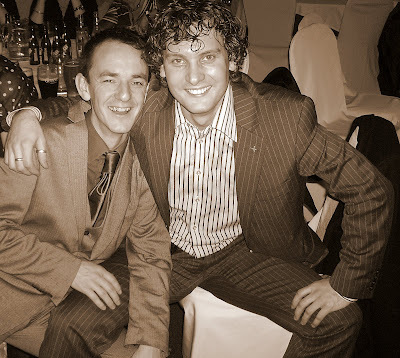 We're both adopted (not just as Grannymar's toyboys) and also apparently both shy, awkward kids growing up, despite a shared love of drama, musicals and singing badly. We're also both, for the most part, well intentioned. In the cartoon, Brain's ambition and drive to "take over the world" is not borne from megalomania, but rather as beneficial to the world. "We're on our way to fame, fortune and a world that's a better place for all." he tells Pinky, and in our version, it's something we're both looking for in our own way. The "fame" however comes from the friends we make, the "fortune" is our contentment with our respective lots (no, not you!) and a better place is bound to have laughter, conversation and a decent pint. "I think so, Darr, but I find scratching just makes it worse." Writing about any friendship is not only difficult but quite insular and prone to excluding those who don't know us. Yet, somehow, strangely it makes sense. Alexia's post yesterday about digital breadcrumbs prompted the question as to whether the way you "judge" people changes the more of their online presence you consume. I think for Darr and Darr it has added an extra dimension to the interaction - we both read and comment on each other's blogs, we'll point out mistakes or suggestions and generally encourage each other's endeavours. We may not always agree but our debating skills improve as a result. Though we attend many of the same events, I somehow feel it's Darren's skill to capture a movie or music in words, which he does with considerable expertise. Other times he'll discover I've done something or tried something which he'll be equally enthusiastic about. The show's theme song informs the viewer that "One is a genius, the other's insane", but does not elaborate further. While Brain may seem more intelligent, Pinky's unpredictable and startling insight as a foil to Brain's rather more plodding and stubborn approach suggests that Pinky is, in fact, the real genius rather than Brain. Darr, are you pondering what I'm pondering?" Whoof, oh, I'd have to say the odds of that are terribly slim Darr. I mean, really, when have I ever been pondering what you've been pondering? Exactly. So, what are the chances that this time, I'm pondering what you're pondering? Well, that's exactly what I'm thinking, too. Therefore, you *are* pondering what I'm pondering. Poit, I guess I am! Narf!" Damn you Byrne, I was doing so well without the image of me as a mouse. That'll stick. So I suppose the question must be asked - "Gee Darr, whaddya wanna do tonight then"? The same thing we do every night, Darr - try to take over the world! One small step at a time. Feck, I'm in bits after reading that. Without any reservations, without any embarrassment or hesitation I say this - I love you, Sir! Now, piss off and do something more productive with your time. (Btw, I've started comparing us to Denny Crane and Alan Shore now too. I'm soo James Spader!!!) Narf! The first comparison images are golden! Great post Darr (agh). Lottie, I think this is Darragh's way of trying to publicly declare his undying love for Darren in the hope he'll return it and will break you poor little heart ;-). Don't know how comfortable I am with the Denny Crane/Alan Shore Combo. Those two get up to some very strange antics! Good friends are to be cherished. There is nothing wrong with your ears, you would look funny with none! I'm going to have to find a way of infiltrating this group so that we have 3 Darrs and really confuse everyone. What a lovely post Darragh. Don't remember Pinky and the Brain... think I'm confusing it with Ren and Stimpy. Hmmm. @Deborah - You Don't remember Pinky & the Brain? :O It was probably the one of the funniest cartoons of my childhood. You should have a look at this too. I think you'll enjoy. hang on, does that mean that Lottie is Elmira? @Will Nope - we worked it out. Lottie is Charlie and we're the two annoying unicorns (I'm the blue one). you know the "one is a genius, the others insane" bit? The creators say that Pinky was the genius and the Brain was insane. Excellent! I go by 'Elmyra' on many corners of the web - enjoyed the post, despite, as a noob, being completely unaware of the darrdarr dynamic! It was very interesting for me to read this blog. Thank you for it. I like such topics and anything connected to them. I would like to read more on that blog soon.